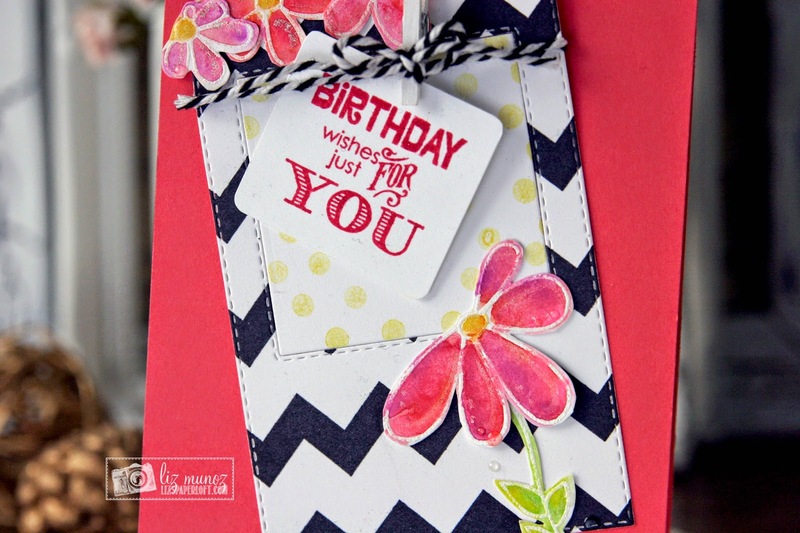 Liz's Paper Loft: MCT Trending Now ~ birthday wishes! MCT Trending Now ~ birthday wishes! Over at My Creative Time it's Trending Now! Today it's all about the BIG BOLD STRIPES, DOTS, and CHEVRONS! They are so HOT right now and I LOVE THEM!!! I really wanted my card to bright, bold, yet feminine. It's somewhat hard to see in the picture, but the yellow dots are much brighter in person. The first thing I did was white heat emboss the flowers on watercolor paper. Then I used distress ink to watercolor the flowers. After they were dry I fussy cut them, added wink of stella and glossy accents. I love adding the glossy accents to the petals and leaves to look like morning dew. For the frame, stamped the bold black chevrons, Now I wish I had made them closer together or added the dotted chevron in between. Funny I was going back and forth of whether to add it or not, but was so afraid I would mess it up, that I left it off. No guts, no glory...lol! Look what's coming up next week!!!!!! I love your card it is so pretty and ahhhh makes me think of Spring....Love how you used Miss Emma's goodies and your inks....You really did an outstanding creative job!! Now I see the clothes pin! 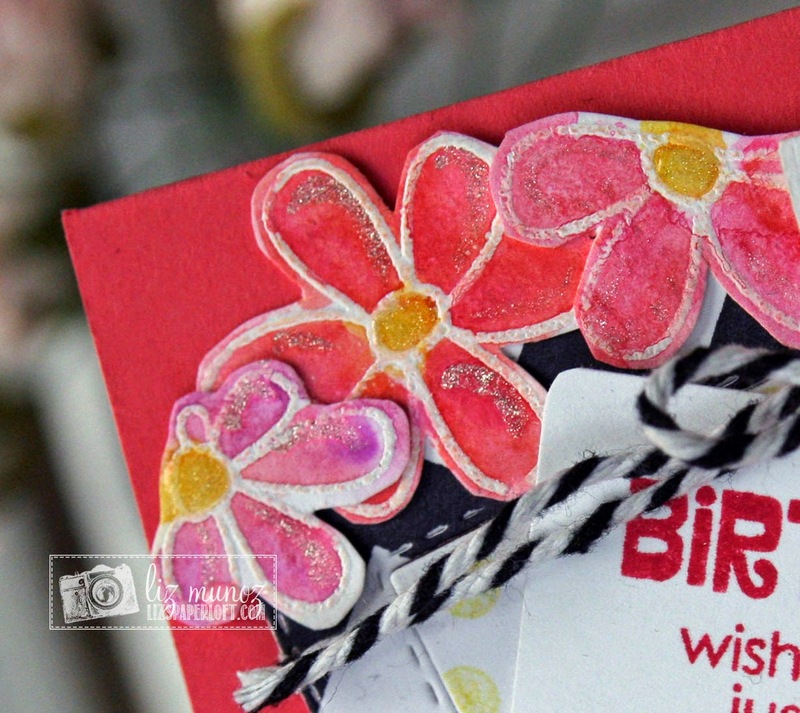 I love how the twine looks with the chevy and the embossing on the flowers before water coloring. I think the dots between the chevrons would have been cool...there is always next time! Beautiful job! Great Job! I think the card turned out adorable without the dotted chevrons! What a beautiful card,Liz!! I love the watercoloring on the pretty flowers and the black chevron!! Just beautiful!!! What a pretty card, fantastic!! Oh Liz ~ this I simply STUNNING!! I LOVE the bold chevron , the flowers and oh my the water coloring!! Oh the no gut no glory comment ~ hahahaha ~ I am like you I would be afraid to mess this BEAUTIFUL card up!!! MCT Favorite Stamp/Die of the Month ~ thanks! MCT February Release Blog Hop ~ happy birthday! MCT February Release Sneak Peeks ~ feelin' lucky! 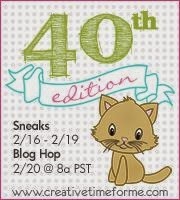 MCT February Sneak Peeks Day 3 ~ hello! MCT February Sneak Peek Day 2 ~ you're purr-fect! MCT February Sneak Peeks Day 1 ~ hey there! 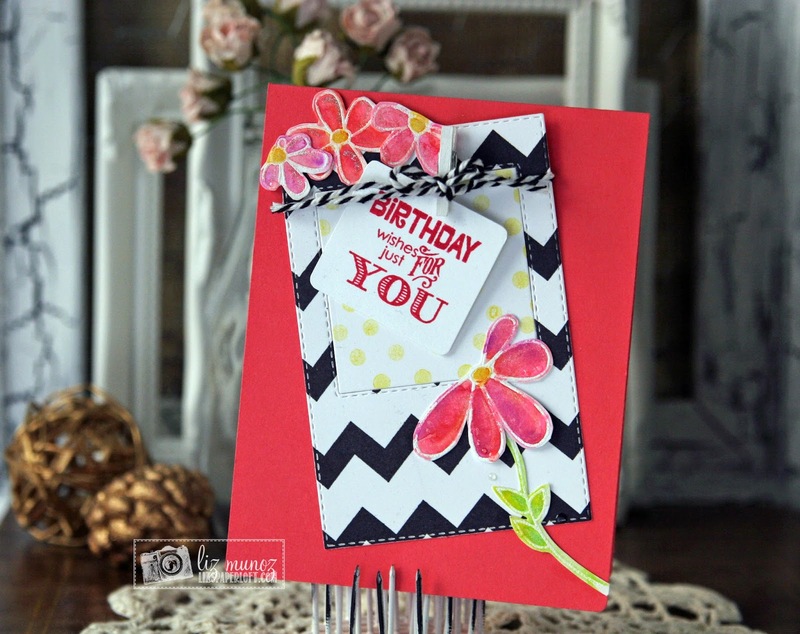 MCT Designers Challenge ~ happy birthday! MCT What a Treat ~ happy valentine's day! MCT Made In Minutes ~ love!